The universe is conspiring against Ava Breevort. As if flying back to Phoenix to bury a childhood friend wasn't hell enough, a cloud of volcanic ash traveling from overseas delayed her flight back home to Boston. 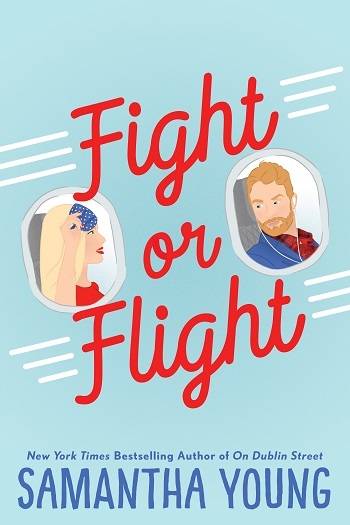 Her last ditch attempt to salvage the trip was thwarted by an arrogant Scotsman, Caleb Scott, who steals a first class seat out from under her. Then over the course of their journey home, their antagonism somehow lands them in bed for the steamiest layover Ava's ever had. And that's all it was—until Caleb shows up on her doorstep. This is a really satisfying read. It is based on a great premise and even if every romance reader will be cheering them onto love, the getting there is so much fun. I laughed so many times at little amusing scenes which were just so perfectly described. I spent a lot of time with a cheery grin on my face and a lot of the rest wishing I were Ava... lucky girl! From the reason Ava is in Arizona to her flaky parents, the lack of manners to the fear of flying, the fraud to the younger brother, it just all works together so well. It is a good, long book, with plenty of lust, and against the rules a growing romance. We are swept along in Ava's life and get her side of the story all the way through. I have to admit at times I was really curious to know what Caleb was thinking, but it was fun to work it out, rather than be told it directly. It ensured that we were just as in the dark as Ava was about his true desires and intentions – well, some of his desires he made well and truly known to her by his actions! I hope that Harper gets her story told as I enjoyed her creative temperament, and her dream of a dessert bar was very appealing. When Ava and Caleb first meet it is a bit of hate at first sight. I wasn’t really fond of Caleb and I was hoping we’d get his point of view because I wanted to know how he was feeling and honestly, I was hoping his point of view would show him in a better light to explain his rudeness. But the story is told entirely from Ava’s point of view and I had to be patient and learn about Caleb and the kind of man he is when Ava did. Parts of this story are really fun and hot, always a good combination. I love in the beginning how they keep running into each other. But there is so much more to this story than the whole enemies-to-lovers thing. Ava and Caleb were realistic and had depth. They are both more than just what you see on the outside and we are given time to get to know the characters and truly learn about them. They we not perfect, they had been hurt, and they were just doing the best they could. 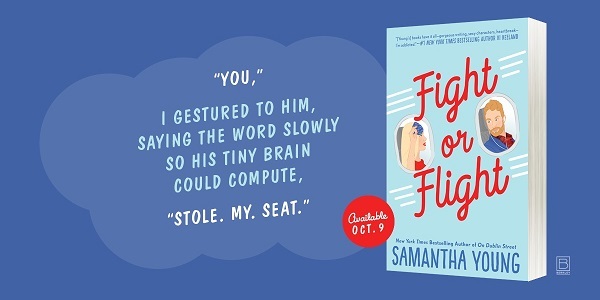 Fight or Flight is a wonderful story. I laughed and cried with these characters. I was so proud of Ava. Her journey and the emotional strength she shows is inspiring, especially toward the end of the story when things aren't going her way. It was just beautiful to see two people who in the past had been hurt by the ones they love the most, be brave and give love another try. Well I really enjoyed this book. Ava just wants to get home after attending her friend’s funeral; the problem, there is only one seat available on the flight. That's where Caleb comes in, he manages to bag the last seat on the flight. Caleb is pretty awful at the beginning, which makes Ava not want to deal with him; however, fate has different ideas as these two keep getting thrown together. As I said, Caleb comes across as a horrible person but as the story unfolds, we find out more about him and my views of him changed. The chemistry is pretty hot between the two of them. I liked that both characters had depth that we got to learn throughout the book. In the end, I finished this book with a big smile on my face. Samantha Young is the New York Times and USA Today bestselling author of the Hart’s Boardwalk series and the On Dublin Street series, including Moonlight on Nightingale Way, Echoes of Scotland Street, Fall from India Place, Before Jamaica Lane, Down London Road, and On Dublin Street. 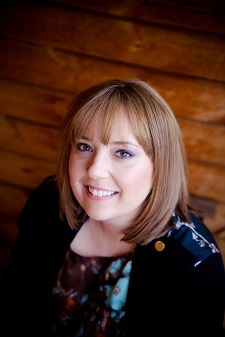 She resides in Scotland. 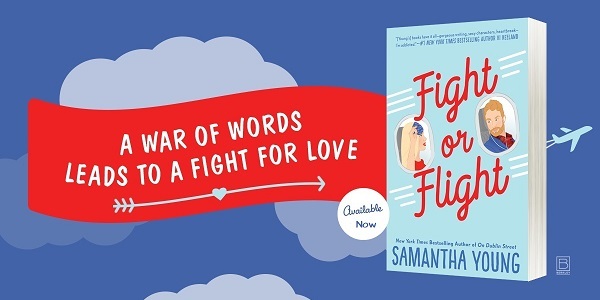 Reviewers on the Wicked Reads Review Team were provided a free copy of Fight or Flight by Samantha Young to read and review.